In our last CUDA C/C++ post we discussed how to transfer data efficiently between the host and device. In this post, we discuss how to overlap data transfers with computation on the host, computation on the device, and in some cases other data transfers between the host and device. Achieving overlap between data transfers and other operations requires the use of CUDA streams, so first let’s learn about streams. Please note that CUDA 7, released in 2015, introduced a new option to use a separate default stream per host thread, and to treat per-thread default streams as regular streams (i.e. they don’t synchronize with operations in other streams). Read more about this new behavior in the post GPU Pro Tip: CUDA 7 Streams Simplify Concurrency. In the above code, as soon as the increment() kernel is launched on the device the CPU thread executes myCpuFunction(), overlapping its execution on the CPU with the kernel execution on the GPU. Whether the host function or device kernel completes first doesn’t affect the subsequent device-to-host transfer, which will begin only after the kernel completes. From the perspective of the device, nothing has changed from the previous example; the device is completely unaware of myCpuFunction(). Non-default streams in CUDA C/C++ are declared, created, and destroyed in host code as follows. To issue a data transfer to a non-default stream we use the cudaMemcpyAsync() function, which is similar to the cudaMemcpy() function discussed in the previous post, but takes a stream identifier as a fifth argument. The CUDA stream API has multiple less severe methods of synchronizing the host with a stream. The function cudaStreamSynchronize(stream) can be used to block the host thread until all previously issued operations in the specified stream have completed. The function cudaStreamQuery(stream) tests whether all operations issued to the specified stream have completed, without blocking host execution. The functions cudaEventSynchronize(event) and cudaEventQuery(event) act similar to their stream counterparts, except that their result is based on whether a specified event has been recorded rather than whether a specified stream is idle. You can also synchronize operations within a single stream on a specific event using cudaStreamWaitEvent(event) (even if the event is recorded in a different stream, or on a different device!). The device must be capable of “concurrent copy and execution”. This can be queried from the deviceOverlap field of a cudaDeviceProp struct, or from the output of the deviceQuery sample included with the CUDA SDK/Toolkit. Nearly all devices with compute capability 1.1 and higher have this capability. 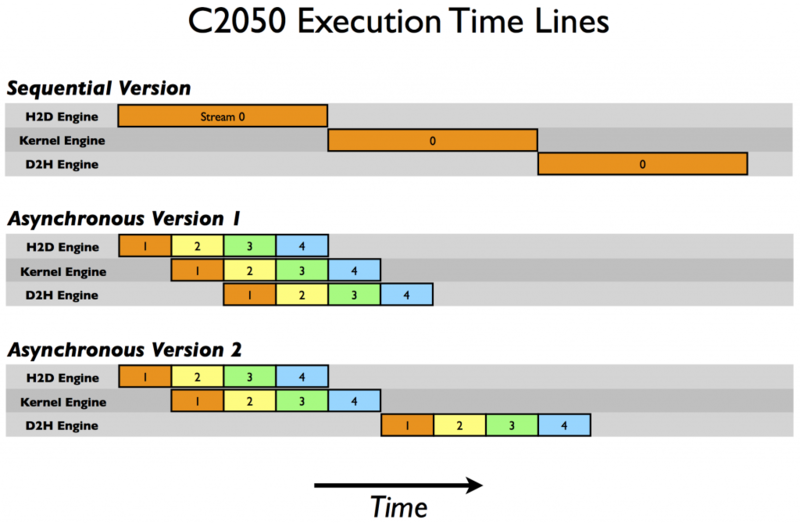 Having two copy engines explains why asynchronous version 1 achieves good speed-up on the C2050: the device-to-host transfer of data in stream[i] does not block the host-to-device transfer of data in stream[i+1] as it did on the C1060 because there is a separate engine for each copy direction on the C2050. 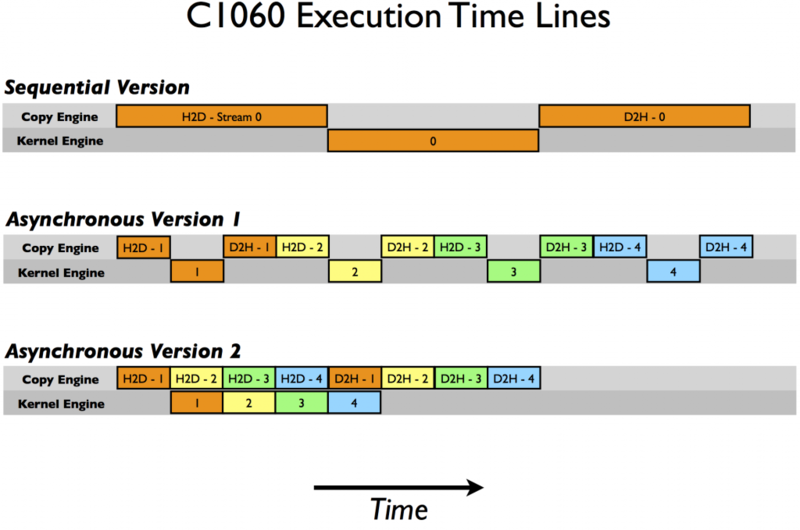 The schematic predicts the execution time to be cut in half relative to the sequential version, and this is roughly what our timing results showed. In a post dealing with streams I should mention that while using the default stream is convenient for developing code—synchronous code is simpler—eventually your code should use non-default streams or the CUDA 7 support for per-thread default streams (read GPU Pro Tip: CUDA 7 Streams Simplify Concurrency). This is especially important when writing libraries. If code in a library uses the default stream, there is no chance for the end user to overlap data transfers with library kernel execution.